If that was the question, the answer is "forget it!" You can forget about the direct translation of "is", "are", "am", "to be" such as in "He is a doctor. ", "They are here. ", "I am fine. ", and so on. The Burmese equivalent of such Verb trans (v.t) are usually found at the end of the sentence by positive affirmation ending words such as "ba2" (particle), and "deare2" (postpositional marker). For example, thu2 hsa1-ya2-woon2 ba2 means "He is a doctor. ", where thu2 is a pronoun "he" or "she", and hsa1-ya2-woon2 (noun) means doctor. Negative ending word "bu3" is in an equivalent of "is not", "are not", "am not" and so on. 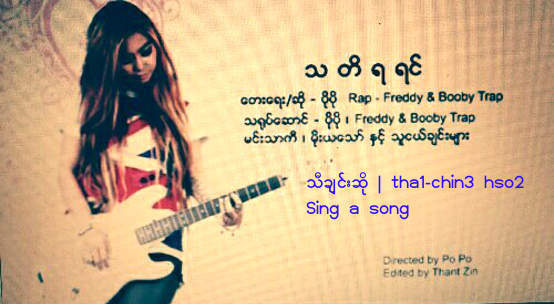 This word is NOT a verb, but a particle in Myanmar grammar. thu2 ma1-shi1 bu3 means he or she is not here. 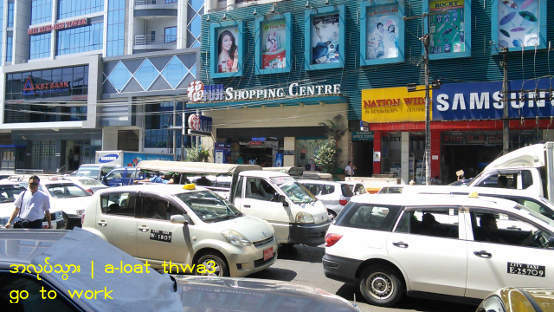 Unlike English word "is", you can still construct the Burmese sentence without using "ba2". For example, thu2 hsa1-ya2-woon2 lay2 means "he is a doctor, don't you know?" Such single-syllable ending words are not verbs, but known as wi1-but (postpositional markers) and pyit-si3 (particles) in Burmese grammar. They are important part of the Burmese sentence as explained in lesson 3. Burmese grammar and verb-suffixes are further explained in lesson 59 for serious learners. Burmese equivalent of "be/is/are/am" such as deare2 are not verbs but post-positional markers, and they form verb clauses only in combination with verbs such as "go", "eat", "come", or adjectives such as "white", "wrong", "hungry". Similarly, ending particle words such as ba2 are combined with nouns: "doctor", "man", "Buddhist" to get the verb clause "be/is/are/am" something or someone. 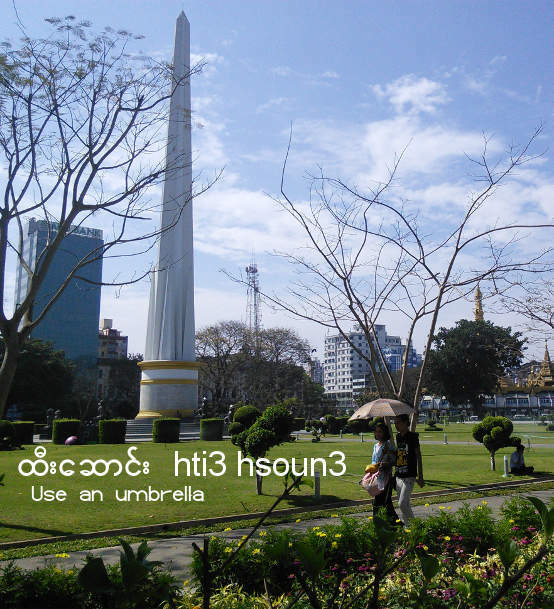 Burmese verbs can be categorized by the above three characteristics. In addition, they can also be classified by three types of sentence construction, so there are a total of six terms that students learn in Myanmar high schools. pyu1 chin3 pya1 kri1-ya2 - action words such as eat, walk, run, write, read. pfyit chin3 pya1 kri1-ya2 - words that show the occurrence, state, or condition. E.g., hta-min3 kjet byi2 - The rice is cooked. shi1-chin3-pya1 kri1-ya2 - words that describe the presence or existence of something. E.g., a-pau2-htut hma2 shi1 deare2 - It is upstairs. pin2-ko2 kri1-ya2 - words that describe the action. E.g., pu2-zau2 - to make a devotional offering. gome2-yay2-pya1 kri1-ya2 - words that show the quality. Those are adjectives converted into verbs. E.g., thu2 tha2-ya2 nay2 deare2 - She is enjoying the experience. The adjective tha2-ya2 meaning "enjoyable" or "pleasant" is modified into the verb by the ending postpositional marker. poun3-sut kri1-ya2 - words that combine two actions. E.g., sa3-thout - to eat and drink; to have a meal. sa3-thout hsine2 (noun) refers to the restaurant. It is a compound word made up of the verb sa3-thout and the noun hsine2 meaning shop. Burmese verbs do not change with tense like in English. Instead, verb-suffix words are appended to show the past tense, present tense, and future tense. thwa3 meare2 - I will go. kan2 dau1 meare2 - I am about to kick. yout pfu3 deare2 - I have been there. na3-leare2 thwa3 byi2 - I have understood now. pyau3 kheare1 deare2 - I have told (him). loat nay2 deare2 - I am doing (something). Similarly, the same verb words are used for both plural and singular forms to say: "He does something" and "They do something." In English, to watch is to look more attentively, not a casual glance by turning your head. You look, you see, and you watch if you like what you see. You see something only after you look -- not you see first then look. Myanmar language is opposite. kji1 in Burmese means to watch as in TV kji1 -- Watch TV as well as to take a look. The negative imperative phrase will be ma1 kji1 neare1 which means either "Don't Watch" or "Don't look". myin2, on the other hand, is perceiving or seeing something as you turn your head. So, myin2 dine3 ma1 kji1 neare1 means "Don't look (and pay attention) every time you see something." How to make requests in Burmese? xxxx chin2 deare2 , where you substitute xxxx with the verb of your choice. a-woot shau2 chin2 deare2 -- I want to wash clothes. yay2 cho3 chin2 deare2 -- I want to take shower. lite chin2 deare2 -- I want to come along. tet -- officer ordering the soldier to go up. tet ba2 -- Driver politely telling the passenger to go inside (up) the vehicle. ba2 ome3 -- softens the tone even more. Sa3 ba2 ome3 "Won't you have (eat) some? Please refer to Lesson 2 and 3 for basic sentence constructions. If you know the general pattern, you can just substitute the verbs in most cases. Note: Most of the action words have noun used as a prefix word in front of the verb. Commands can be stand alone verbs, but in phrases and complete sentences, related noun must be used as a prefix to avoid ambiguity. Note: Public buses are now called line3 ka3 where line3 refer to the route indicated by the route number. Rates in Yangon as of July 2016 range from 200 Kyat to 300 Kyat for the entire trip covering greater Yangon that stretches as far as 15 miles. On January 16, 2017 a new bus system (YBS) with new numbers were introduced in Yangon. See the routes with all the bus stops and detailed maps at https://ygnbuses.com. twet-chet -- calculate; do the math. Note: pfo1 may sound more like bo1 when spoken. a-loat hsin3 -- to end work as in the end of shift and knock-off time (work [noun] + to go down) Oddly enough, it also refers to start work in the beginning of shift. For the later case, the reference point is probably going down the stairs of one's home. kjoun3 hsin3 -- finish class. (school + to go down); never use this for start of class. hloot lite -- release by ungrasping of the hand, by withdrawal of the foot, letting go mentally, or to physically release a captive. The formal word to sign the name is let-hmut hto3, to make payment at the counter is ngway2 thwin3 (money + to deposit), and cha1-lun2 htoat means to get the receipt (receipt + to issue).